Walking through the halls of the Las Vegas Convention Center, one thing becomes abundantly clear. 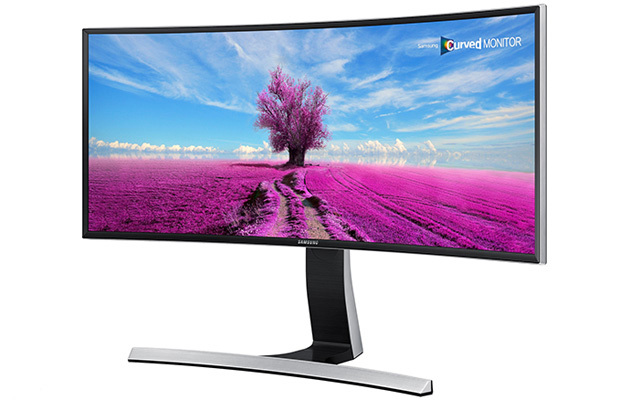 Curved displays are apparently all the rage. They're everywhere and include everything from Ultra-HDTVs, monitors and even smartphones. Much like 3D televisions of the past, it seems like every hardware manufacturer got together and said, "This is exactly what consumers need!" The thing is, I've yet to meet anyone who has one. Are they the real deal? Head over to the Engadget forums and share your thoughts! 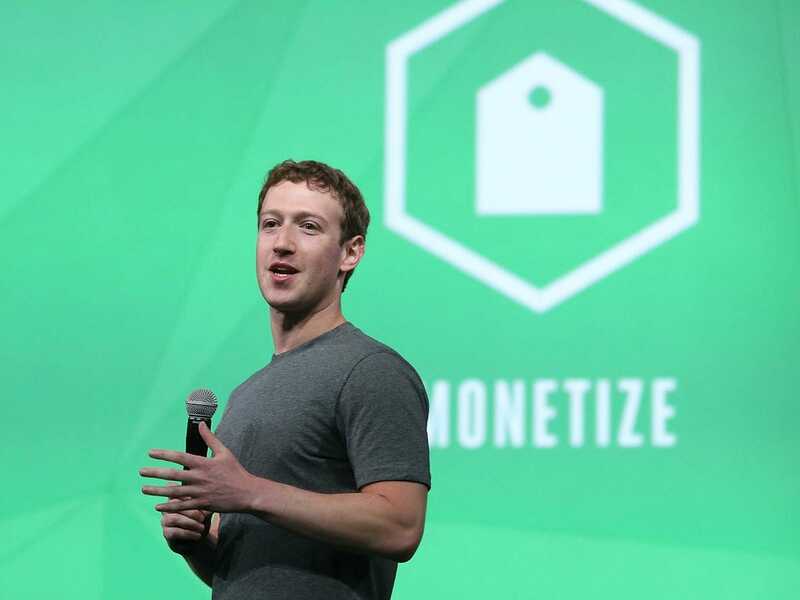 Facebook has acquired video technology startup QuickFire Networks for an undisclosed amount. QuickFire Networks CEO, Craig Y. Lee, announced the acquisition on the company website. “QuickFire Networks was founded on the premise that the current network infrastructure is not sufficient to support the massive consumption of video that’s happening online without compromising on video quality,” Lee writes. QuickFire’s technology reduces the bandwidth needed to watch video online without sacrificing on video quality. Facebook averages more than one billion video views per day, so it makes sense that they’d want to deliver a higher quality video experience to users. The company posted a blog post on January 7th outlining “what the shift to video means for content creators,” and highlighted how integral video had become to the platform. Facebook noted that, on average, more than 50% of people who come back to Facebook every day in the US watch at least one video daily and in a single year Facebook video posts per person increased 75% globally and 94% in the United States. QuickFire will be able to help streamline the increased video consumption and provide support to the platform as it rolls out more video in emerging markets, which frequently have slower connections. A group of key QuickFire employees will be joining Facebook as part of the acquisition. In the meantime, the company will be reaching out to individual customers and partners as business winds down. Almost nobody is using Google’s latest and most ambitious update to its Android operating system. Based on the company’s latest numbers charted for us by BI Intelligence, less than 0.1% of all Android devices are running the latest version, called Lollipop. It doesn't even appear on the chart, because we don't show distributions with less than 0.1% adoption. 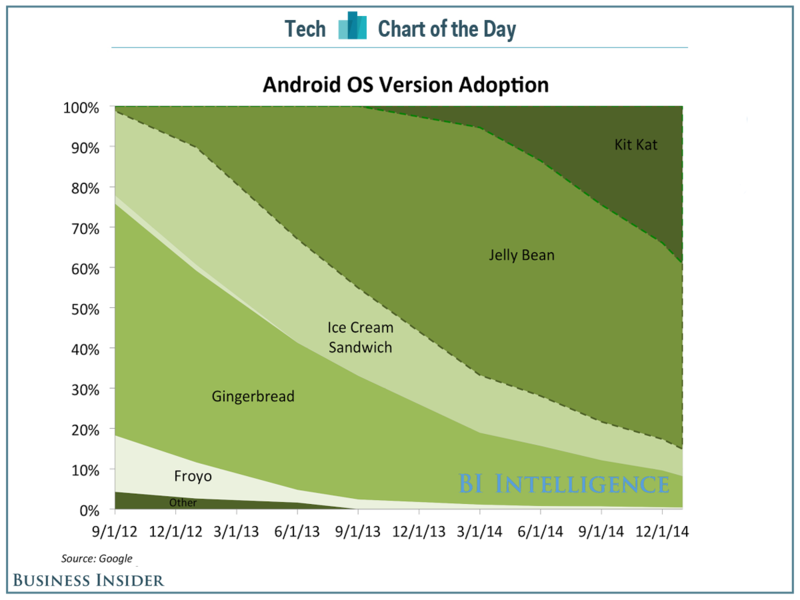 Most Android users are still on Android Jelly Bean (46% of devices), followed by KitKat (39.1%), the most recent version of Android that came out before Lollipop. Android suffers from a ton of "fragmentation" — that is, many different versions of the software out at the same time — because Google gives third parties like hardware makers and carriers lots of leeway on what they can do with the platform. It’s difficult to roll out new updates since each new software edition must pass through so many different channels before it reaches the end user. Unfortunately, this makes it hard for developers trying to build Android apps — which version do they build for? 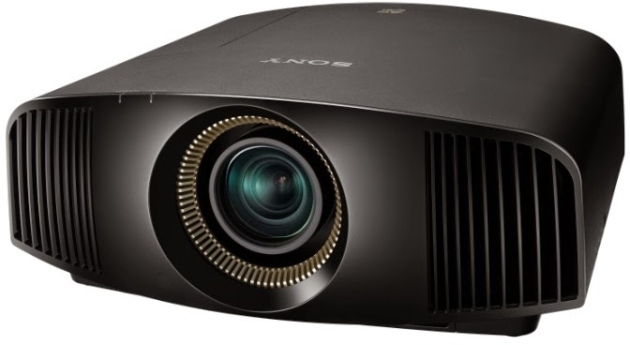 Sure we can spend all day at CES checking out ridiculously large UHD TVs, but if you want to max out your home theater then a projector is the only way to go. Luckily, Sony has two fresh choices here at CES 2015 if you can afford them. First up is its VPL-VW350ES, which qualifies as the value option by bringing its 4K capabilities for under $10,000 -- hardly cheap, but until now the cheapest option has been the $15,000 VPL-VW600ES. 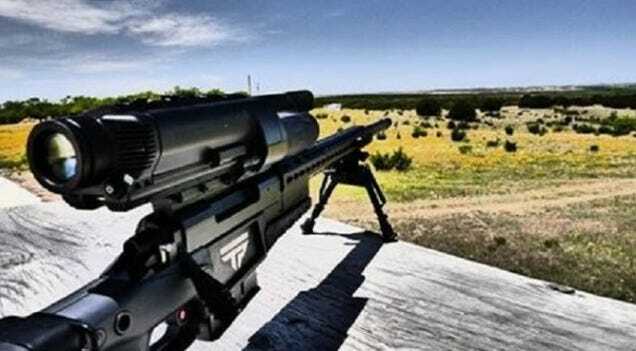 On the opposite end of the spectrum is the laser-powered VPL-GTZ1. We saw it last year as a part of the Life Space UX concept, but for the last few months, New York's well-heeled customers have been able to pick one up for just $50,000. 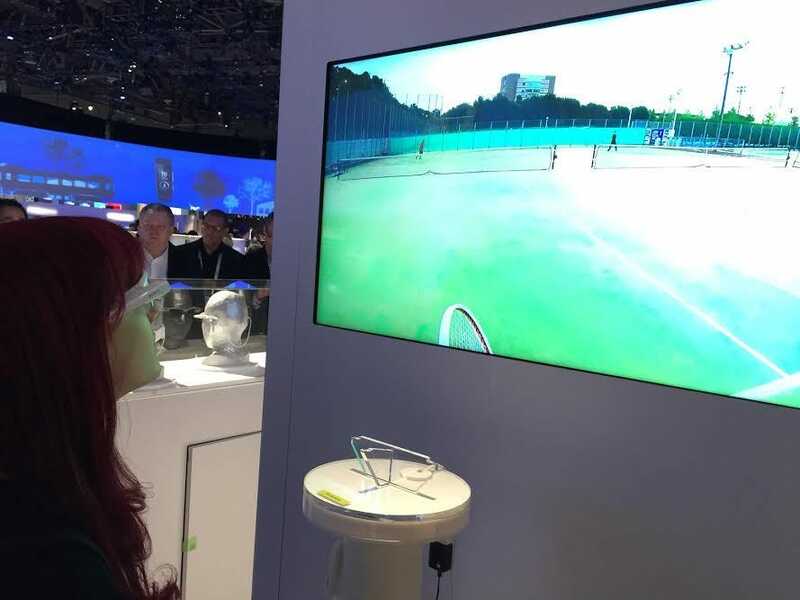 Naturally, Sony brought two of them to CES, showing off their "ultra short-throw ability" to beam a 4K image on a wall from just a few inches away. Perhaps the perfect choice for someone with more money than space, we will sadly have to pass on taking either one home, for now. From MKM Partners' Jonathan Krinsky: "There are likely different explanations for this, and while the results span 130 years, the actual number of samples is quite small. With that said, the results are quite remarkable. 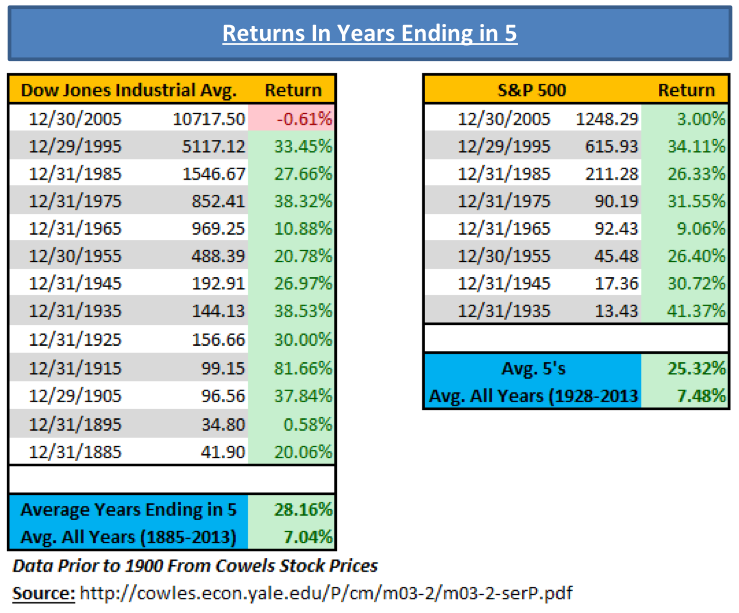 Since 1885, there have been 13 years ending in “five.” The Dow Jones Industrial Average has been up 12 of 13 times, for an average return of over 28%. Only 2005 closed down, and it was a modest -0.61%. The SPX was up 3% in 2005. As you can see below, the average returns for the DJIA in years ending in five are 4x the average year. Of course we would never recommend an investment strategy based solely on this phenomenon, but it certainly doesn’t hurt the bull case." Parrot's new Zik Sport headphones are noise-canceling Bluetooth headphones that offer a heart rate sensor, pedometer and a five-hour battery. 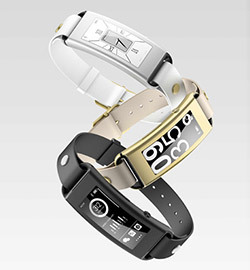 Lenovo's beautiful Vibe Band VP10 gives a new spin on the standard wearable by offering Bluetooth notifications on an E Ink screen. 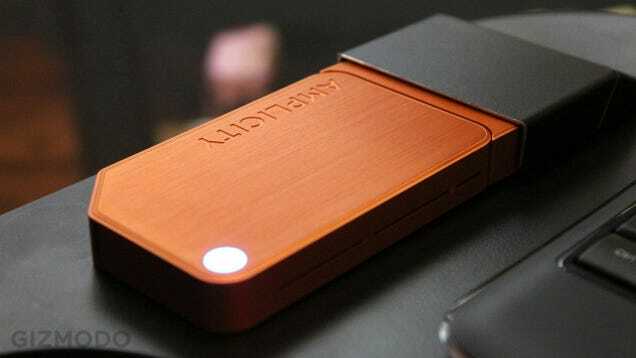 It also tracks your steps, calories, distance traveled and sleep quality. Plus, it's waterproof and comes in an array of stylish metallic colors. 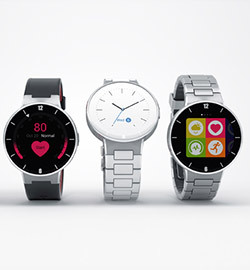 Alcatel OneTouch's smartwatch bucks the dominant wearables trend by skipping Android Wear in favor of its own proprietary software. What that means is that it can't run some of the more out-there apps we've seen, but do you really need a watch to be able to start your car? 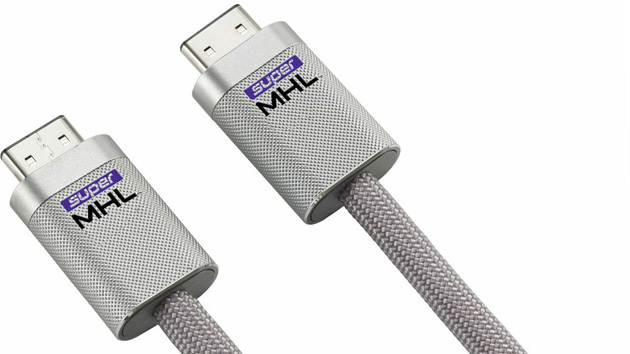 With stylish looks, solid features and a cheap price, it's certainly an interesting device. 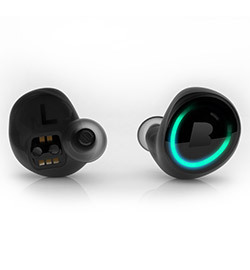 Bragi's Dash smart headphones are so impressive, that they deserved to be in the wearables category, too. 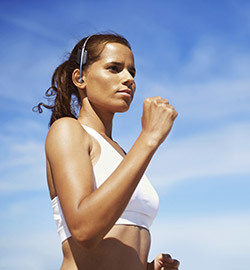 They're waterproof and touch-controlled and can do things like play media and track your fitness. This year's NFL playoffs show how more than ever it is important to have a franchise quarterback leading your team as the eight signal callers still standing have combined for 53 playoff wins and seven Super Bowl championships. 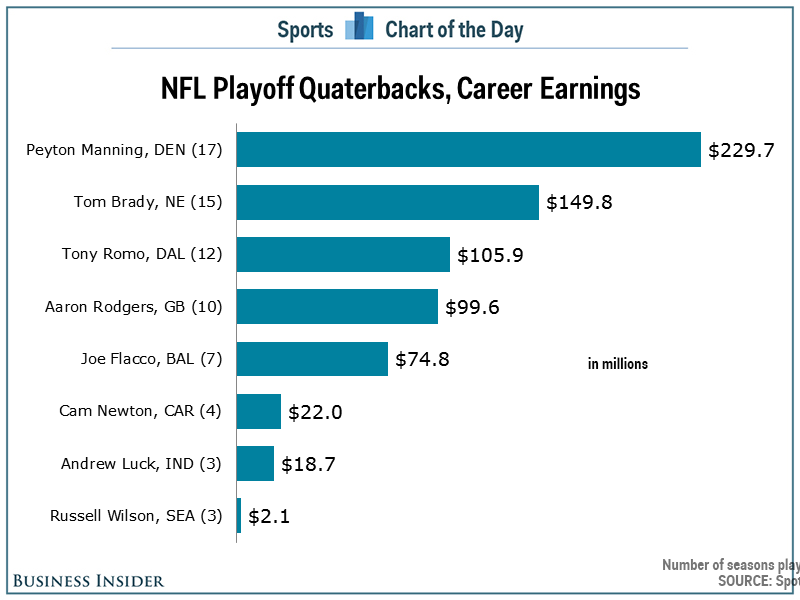 But while all would be considered among the best quarterbacks in the NFL, there is a huge gap in how much they have earned in their careers, with Peyton Manning topping the list with $229.7 million in career earnings according to Spotrac.com. At the other end, Russell Wilson of the Seattle Seahawks has made just $2.1 million in his career despite having already won a Super Bowl. But don't worry, Wilson's day is coming and there is a good chance he will be the NFL's next $100 million quarterback as early as this off-season. 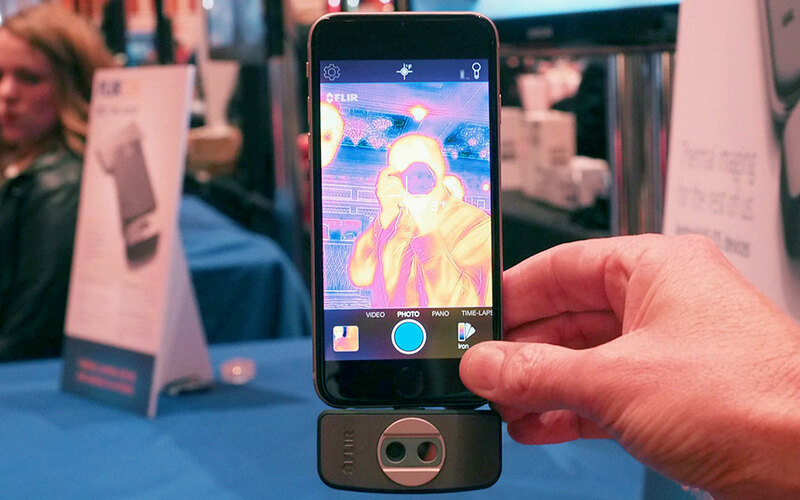 When FLIR launched its first smartphone-based thermal camera at last year's CES, the biggest annoyance people had was that the hardware was baked into an iPhone 5 case. Anyone who wasn't toting Apple's newest two smartphones was understandably aggrieved about that decision. That's why, as a do-over, the company has released a second-generation FLIR One that clips onto the bottom of your smartphone over Lightning or micro-USB, letting Android users in on the fun. We got to see a prototype of the new model here at CES and, aside from the smaller body, the new unit gains an automatic shutter and a better-resolution sensor. Unlike (bitter rival) Seek Thermal, which draws its power from the device itself, FLIR One has a built-in battery, although it's only likely to last for an hour on a charge. The companion app has also been refreshed, and now you can use panorama and time lapse from, in this case, the iPhone's native camera software. 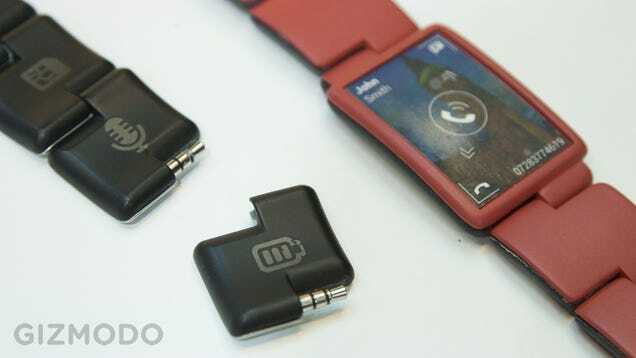 The device is expected to arrive in the mid-part of the year, with a price that's probably comparable to the original. In addition to an action-cam for adventurous kids, Fuhu has announced new Big Tab options at CES -- and they're so huge, they dwarf the 24-inch model launched in 2014. These latest entries to the Big Tab lineup include 42-inch, 55-inch and 65-inch models, so they're definitely not something you'd hold in your hand to watch Netflix or check your emails on. 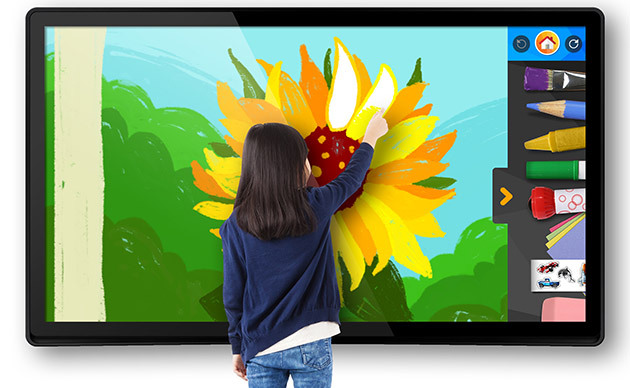 Fuhu envisions these tablets to be used in kitchens and living rooms for interactive activities or as smart TVs, as they're touchscreen displays with access to Google Play. The 55- and the 65-inch ones even have full ultra HD resolution, built-in WiFi, Bluetooth and NFC. According to USA Today, these huge tablets will hit the market in the second half of 2015, with the cheapest option priced at $699. Obviously, the most expensive one will cost you quite a bit: $3,999 for the 65-inch 4K UHD model. We just got a chance to see exactly what E Ink's new Prism tech looks like in person. And? It's pretty neat! As you might be able to tell from the admittedly sped-up GIF above, it's a bit mesmerizing, but still manages to be subtle. The outfit's Joseph Fillion describes it as "more than static, but not quite digital." What he means by that is it isn't the type of thing you'd likely see used on billboards or other advertisements, but more along the lines of navigational opportunities and branding. 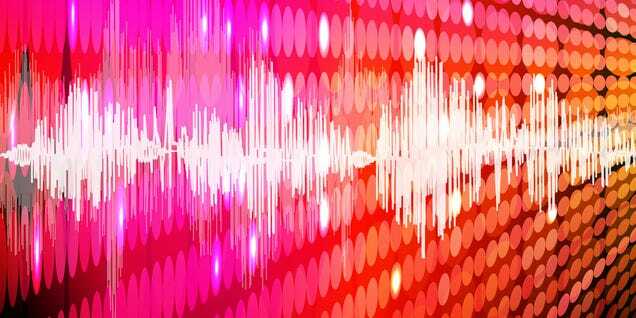 For example, you could carry an RFID chip in your pocket at a hotel and it'd change the color of the walls letting you know you were actually headed in your room's direction, possibly with the place's logo appearing once you've reached your destination. Or imagine your living room's walls changing color in accordance to your thermostat's temperature reading. It seems futuristic as hell, but it's much more Her than Blade Runner. 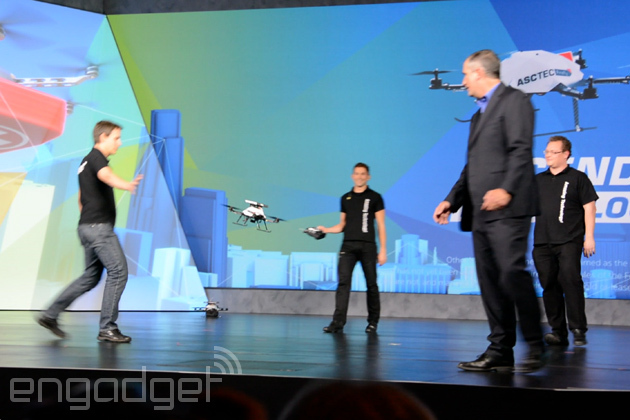 At this year's CES, Intel's keynote is all about the future of computing. 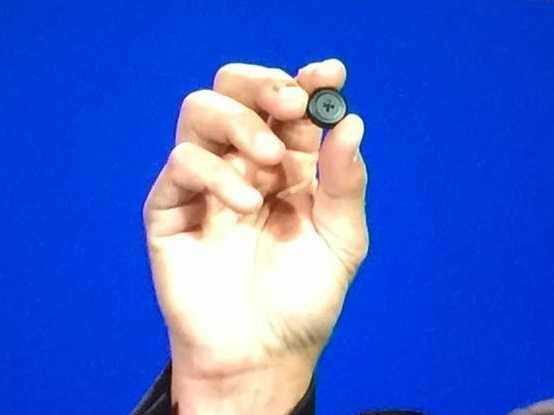 It just rolled out the Curie, a computer that's literally the size of a button. It's just a prototype, but it's loaded with sensors and can run for extended periods of time. 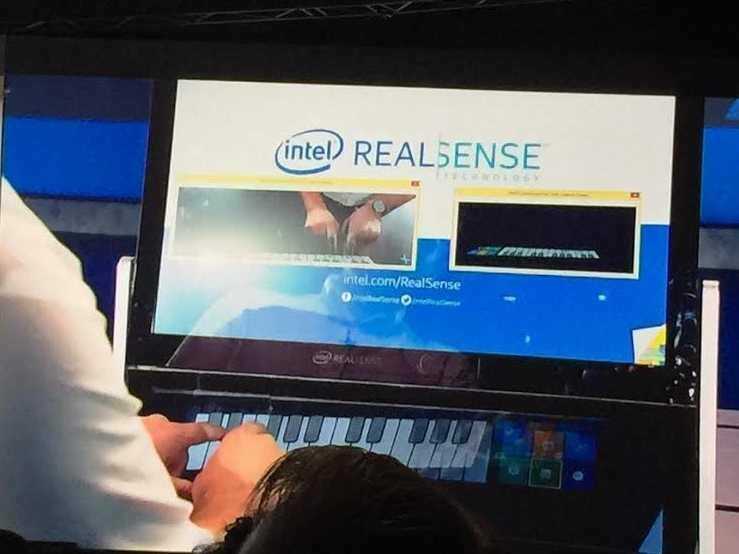 Intel is also talking a lot about how to control computers through gestures rather than with a traditional keyboard and ouse. As one of its examples of how that tech can be used, the company demoed a 3D monitor that had a 3D camera embedded inside. During the demo, the man was able to play a virtual piano without actually touching the screen. This allowed him to actually press virtual keys as if he was really playing a piano rather than just tapping a screen. 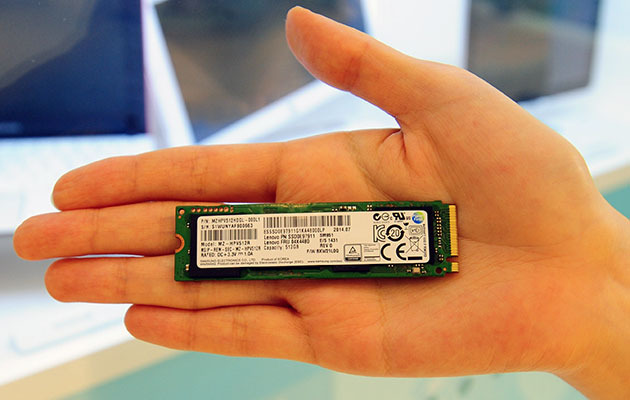 Intel hasn't implemented this type of technology in any real products yet, but it's an interesting concept. Remember that 8-inch, super-high-res tablet Dell showed off back in September? You know, the one with the depth-sensing camera? It's OK if you don't, but really, you should give this a second look -- yes, even if you have tablet fatigue. Dell's Venue 8 7000 series goes on sale today, with a starting price of $400, and it's notable for not one, but several reasons. For starters, it's the first with Intel's RealSense camera setup, which in this case includes an 8-megapixel rear camera paired with two 720p ancillary ones. The three sensors work together to shoot different variations of a shot, each with a different area of focus. Basically, then, you can go in after the fact and either sharpen or soften the focus on any part of the photo -- yep, just like on a Lytro camera. Also, because these photographs are actually a composite of three different shots, you can easily apply effects to select parts of the picture. Think: sepia for just the bride and groom, with bright colors in the background. (Don't judge me for my tacky taste, OK?) Lastly, an over-the-air update in the coming months will allow you to actually measure items in the photo with an on-screen ruler. Other than those fancy camera tricks, you should be impressed by the hardware: It's damn gorgeous. 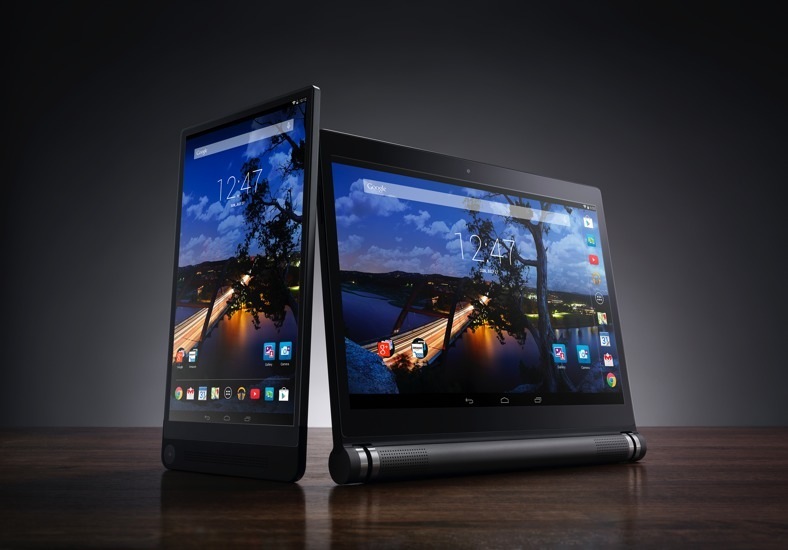 With the new Venue 8, Dell combines a pixel-dense 8.4-inch, 2,560 x 1,600 display with a well-made aluminum frame that measures just 6mm thick. To put that in perspective, that's thinner than all of its main competitors -- namely, the Samsung Galaxy Tab S, iPad Air 2 and iPad mini 3. And, because that screen is an OLED panel, the quality is stunning as well: punchy colors and wide viewing angles, with a strong backlight throughout. What's nice, too, is that Dell was smart enough to price it at $400 -- just low enough to give the Galaxy Tab S and iPad mini 3 a run for their money. Hopefully we'll get to review one of these soon, but if you seriously can't wait for us to weigh in, it's available now, with 16GB of storage (expandable via microSDXC) and either LTE or just WiFi. Every year, TVs are a big deal here at the Consumer Electronics Show. Therefore, it's no surprise that Sharp would have a huge presence here in Las Vegas. And when I say huge, I mean huge. Just like last year, when it teased its 85-inch 8K TV with glasses-free 3D, Sharp's now showing off a 120-inch 4K Commercial LCD display. According to the company, one day this could replace video walls in public spaces (like at Times Square, for instance), as well as projectors in classrooms and conference rooms. At the moment, there's no word on how much one of these would cost interested parties -- but it's safe to imagine it won't be budget-friendly at all. Unfortunately, no image could do this display justice -- you have to be in front of it to see how beautiful it is. It's extremely, well, sharp, bright and it makes you feel as if you're staring into a wall, living in whatever world you're looking at. So, if you're here at CES, it's definitely worth checking out. And why not, maybe one day you could see one of these, or something similar, make its way into the consumer market. One of the biggest problems with wearable head displays so far is that tech companies have a hard time making gorgeous products that people actually want to wear. Most notably, Google launched its developer version of Glass in 2012, but the actual product still hasn’t launched yet and even company execs don't wear them in public very much these days. But Sony’s doing things a little differently. Sony’s new SmartGlasses Attach clips on to your existing sunglasses or prescription glasses so that you can wear it whenever you feel like you may need it. With Sony's approach, you can wear the same glasses you've always worn — the style is barely an issue. It’s not meant to be an “always on” display like Google Glass, which you’re kind of stuck wearing for a long period of time once you leave the house with it. 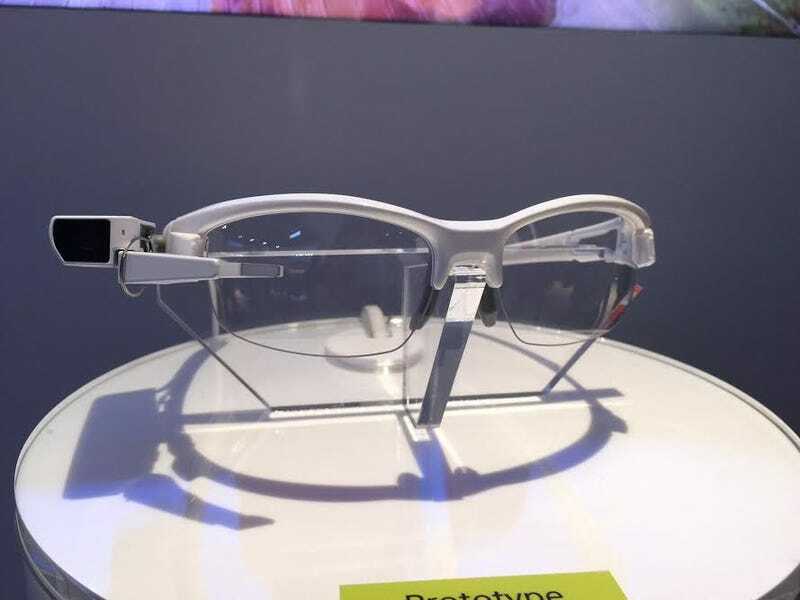 Sony’s new gadget does a lot of the same things Google Glass does, but the demos we’ve seen so far show how it works in specific circumstances. For example, if you’re going for a bike ride, you’d be able to view a compass that tells you which direction you’re going. The display itself is small, but much brighter than that of Google Glass. The screen sits above the corner of your right eye completely out of view, and you need to make a conscious effort to look over at it. This seems like a necessity to avoid blocking your view. But if you’re using it during a sport or a bike ride like Sony advertises, it seems like diverting your attention to look over at the display could pose an inconvenience. This is where Google’s more visible display actually seems more useful. Overall, though, the prototype I played with worked well, and it seems like a more sensible approach to wearable di! splays t han what we’ve seen so far. Google generated a lot of buzz with Glass a few years ago, making it seems like a gadget for adventurers that want to document their experiences. Sony’s gadget lets you do that, too, but you can take it off when you’re finished and go back to wearing normal glasses.